We investigate coherent propagation through a large optical density Tm3+:YAG crystal. Using an ultrastable laser, fiber filtering, and site selection, we investigate the transmitted pulse temporal profile. The plane-wave condition is satisfied by selection of the illuminated-spot central area. We pay special attention to π pulse transmission in the prospect of implementing optical quantum storage protocols. R. H. Dicke, “Coherence in spontaneous radiation processes,” Phys. Rev. 93, 99-110 (1954). N. E. Rehler and J. E. Eberly, “Superradiance,” Phys. Rev. A 3, 1735-1751 (1971). S. L. McCall and E. L. Hahn, “Self-induced transparency by pulsed coherent light,” Phys. Rev. Lett. 18, 908-911 (1967). R. E. Slusher and H. M. Gibbs, “Self-induced transparency in atomic rubidium,” Phys. Rev. A 5, 1634-1659 (1972). R. E. Slusher, H. M. Gibbs, “Sharp-line self-induced transparency,” Phys. Rev. A 62326-2334 (1972). S. L. McCall and E. L. Hahn, “Self-induced transparency,” Phys. Rev. 183, 457-485 (1969). K.-J. Boller, A. Imamoglu, and S. E. Harris, “Observation of electromagnetically induced transparency,” Phys. Rev. Lett. 66, 2593-2596 (1991). 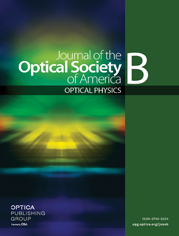 M. J. Konopnicki and J. E. Eberly, “Simultaneous propagation of short different-wavelength optical pulses,” Phys. Rev. A 24, 2567-2583 (1981). S. E. Harris, “Electromagnetically induced transparency with matched pulses,” Phys. Rev. Lett. 70, 552-555 (1993). V. V. Kozlov and J. E. Eberly, “Ultrashort pulses in phaseonium: the interplay between SIT and EIT,” Opt. Commun. 179, 85-96 (2000). A. V. Turukhin, V. S. Sudarshanam, M. S. Shahriar, J. A. Musser, B. S. Ham, and P. R. Hemmer, “Observation of ultraslow and stored light pulses in a solid,” Phys. Rev. Lett. 88, 023602 (2001). F. Schlottau, M. Piket-May, and K. Wagner, “Modelling of femtosecond pulse interaction within homogeneously broadened media using an iterative predictor corrector FDTD method,” Opt. Express 12, 182-194 (2005). R. E. Slusher,“Self-induced transparency,” in Progress in Optics, E. Wolf, ed. (North Holland, 1974), p. 55. Y. Sun, G. M. Wang, R. L. Cone, R. W. Equall, and M. J. M. Leask, “Symmetry considerations regarding light propagation and light polarization for coherent interactions with ions in crystals,” Phys. Rev. B 62, 15443-15451 (2000). G. Zumofen, F. R. Graf, A. Renn, and U. P. Wild, “Pulse propagation in rare-earth ion doped crystals,” J. Lumin. 83-84, 379-384 (1999). C. Greiner, B. Boggs, and T. W. Mossberg, “Superradiant emission dynamics of an optically thin material sample in a short-decay-time optical cavity,” Phys. Rev. Lett. 85, 3793-3796 (2000). Pierre Bouguer, Essai d'optique sur la gradation de la lumière, print. by Claude Jombert, In-12, 164 pages (1729), Paris. W. Miklaszewski and J. Fiutak, “The effect of the homogeneous broadening on the propagation of the light pulses,” Z. Phys. B 93, 491-499 (1994). J. Ruggiero, J.-L. Le Gouët, C. Simon, and T. Chanelière, “Why the two-pulse photon echo is not a good quantum memory protocol,” Phys. Rev. A 79, 053851 (2009). Hugues de Riedmatten, Mikael Afzelius, Matthias U. Staudt, Christoph Simon, and Nicolas Gisin, “A solid-state light-matter interface at the single-photon level,” Nature 456, 773-777 (2008). Mikael Afzelius, Christoph Simon, Hugues de Riedmatten, and Nicolas Gisin, “Multimode quantum memory based on atomic frequency combs”Phys. Rev. A 79, 052329 (2009). G. J. Pryde, M. J. Sellars, and N. B. Manson, “Solid state coherent transient measurements using hard optical pulses,” Phys. Rev. Lett. 84, 1152-1155 (2000). F. de Seze, V. Lavielle, I. Lorgeré, and J.-L. Le Gouët, “Chirped pulse generation of a narrow absorption line in a Tm3+:YAG crystal,” Opt. Commun. 223, 321-330 (2003). F. de Seze, F. Dahes, V. Crozatier, F. Bretenaker, and J. -L. Le Gouët, “Coherent driving of Tm:YAG ions using a complex hyperbolic secant optical field,” Eur. Phys. J. D 33, 343-355 (2005). Fig. 1 Area theorem: pulse area transmission factor A out ∕ A in as a function of the incoming pulse area A in . Labels ( a ) to ( l ) refer to the different input-area conditions considered in Fig. 2. Fig. 2 Numerical solution of the MB equation. The incoming rectangular pulse (dotted line) propagates through an α L = 5 sample. The temporal profile of the pulse at the output (solid line) is displayed for different values of the input area. Time and outgoing pulse amplitude are normalized to the duration and the amplitude of the incoming pulse, respectively. The box labels refer to the corresponding area values, as predicted by the McCall and Hahn theory in Fig. 1. Fig. 4 Experimental profile of the transmitted pulse amplitude (solid line). Input area ( A in ) ranges from 0.5 ⁢ π to 3.4 ⁢ π . Input pulses (dotted line) are rectangular with 7 μ s duration. Fig. 5 Pulse area transmission factor A out ∕ A in as a function of the incoming pulse area A in . Input pulses are rectangular with 7 μ s duration. Theory accounts for a finite coherence lifetime of 50 μ s (solid line) or 10 μ s (dashed line). Fig. 6 Time evolution of the radial field distribution at the crystal output. The incoming rectangular pulse with unit time duration exhibits a radial Gaussian profile with waist w 1 . The field area is set equal to 1.1 ⁢ π on the beam axis. The pulse reaches the crystal at time 0. Within the duration of the incoming pulse, the radial profile of the field is not strongly distorted by propagation. On the contrary, the beam radius shrinks dramatically during the delayed response of the atoms. (3) v ( ω a b ; z , t ) = v ( ω a b ; z , t − τ ) cos ( Δ τ ) + u ( ω a b ; z , t − τ ) sin ( Δ τ ) − ∫ 0 τ Ω ( z , t − τ ′ ) w ( ω a b ; z , t − τ ′ ) cos ( Δ τ ′ ) d τ ′ . (5) v free ( ω a b ; z , t − τ , t ) = v ( ω a b ; z , t − τ ) cos ( Δ τ ) + u ( ω a b ; z , t − τ ) sin ( Δ τ ) . (6) Ω ( z , t ) = Ω ( 0 , t ) e − α z ∕ 2 − α 2 π ∫ 0 z d z ′ e − α ( z − z ′ ) ∕ 2 ∫ d ω a b v free ( ω a b ; z ′ , t − τ , t ) . (8) u free ( ω a b ; z , t − τ , t ) = u ( ω a b ; z , t − τ ) cos ( Δ τ ) − v ( ω a b ; z , t − τ ) sin ( Δ τ ) . (14) V ( ω a b ; z , t ) = v ( ω a b ; z , t ) − ∫ 0 ∞ Ω ( z , t − τ ′ ) cos ( Δ τ ′ ) d τ ′ . (16) 1 + ( L λ 2 ⁢ π n w 0 ′ 2 ) 2 .